Still a Great Night? Biggest Live TV Blunder of All Time? 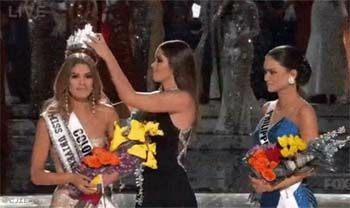 OMG, the announcer made a mistake announcing the winner of Miss Universe. He announced the winner was Ms. Colombia. After the applause they crowned Ms. Colombia, and she was waving to the crowd with her flowers and little flag of Colombia when the show host came back to the stage and said "Ok Folks, I have to apologize, the First Runner is Colombia. Ms. Universe 2015 is Philippines." He read the wrong name. Ms. Colombia, who doesn't speak English and used an interpreter all night, had no idea what happened. Either did Ms. Philippines, the intended winner, even though she does speak English.